I love making my costumes every year. I decided to go as Steven Kings Carrie. So much fun to make. I was so lucky to find a pink long dress at the thift store for under $10.00. Bought a white wig. I went to Michael’s craft store and purchased BRIGHT red fabric paint (can use craft paint too, don’t really need fabric paint). To make it look as if blood was running down my dress I put a little bit of the paint on the top part of the dress and then took a spray bottle full of water and sprayed the dress. The water made the paint run down the dress to the bottom (spray very little, don’t need to much water) . This is very messy so do it outside and let dry outside for a few hours. For the wig, I also put red paint all of the wig and again used water to make the paint run down. For my face, I just bought fake blood you can buy for your skin. 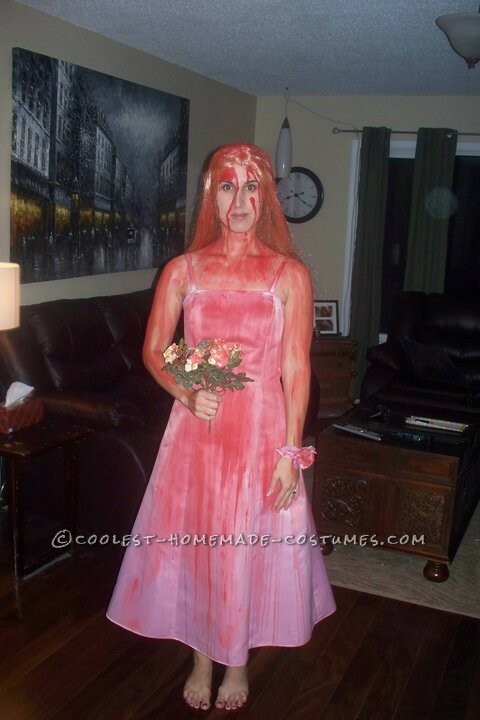 This Carrie Halloween costume was cheap and so easy to make!